Here is a fun exercise working with the energy of garnets and making a vision board that triggers a creative flow. 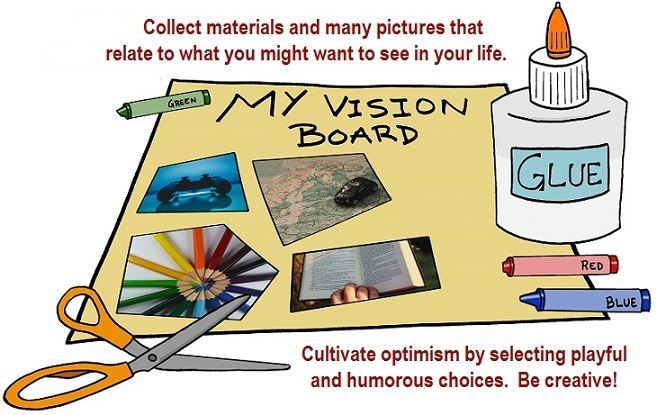 Author Judy Hall in her book, Life-Changing Crystals, gives her readers the following exercise: Activating Your Creativity – The Vision Board. You will need a selection of garnets (1-red, 1-orange and 5-grossular garnets), a collection of images, glue, scissors, and a piece of cardboard. 1. 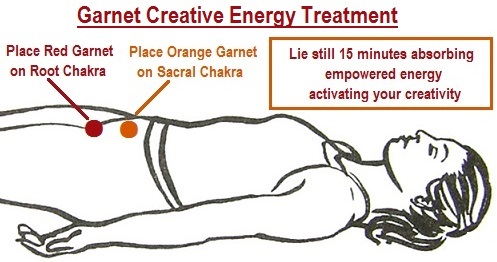 The first part of this creative building exercise is to lie down in a quiet place and place the red garnet on your Root Chakra and the orange garnet on your Sacral Chakra for 15 minutes and allow these chakras fizz with energy. 2. Gather as many pictures as possible of everything that you would like to see in your life—no matter how ridiculous, outrageous, and bizarre you might think they seem. Be playful in your choices. Cultivate optimism when you do this, and do not judge as to whether it is practical or sensible. 3. Stick the pictures onto a large piece of cardboard, overlapping them so there are no gaps in the energy. Put images of confident, creative people on the board, as well as items, places, situations, gifts, and goals you seek to attain in your life. This is an excellent opportunity to invite your inner-child to come out and play with you. 4. 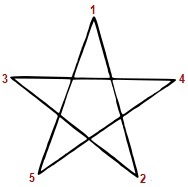 When the board is complete, lie it down and, with your left hand, place the five Grossular Garnets in a five-pointed star shape. Join up the lines between the points by tracing them with your finger. Start with #1 and trace in numerical order finishing connecting #5 to #1. This is a manifesting layout or referred to as the caller-in of love, abundance, and healing. It is a traditional shape for grounding your wishes. 5. The last step is to take the garnets you placed on your chakras (red & orange), touch your forehead and then put them in the center of your vision board. If possible, stick all the garnets in place and display the board where you can see it often. HAVE FUN ACTIVATING YOUR CREATIVITY!